On August 26, Catherine Miranda won her primary election in the 27th legislative district. In November, she faces a Republican challenger, but is expected to be handily elected to represent her solidly Democratic district in the state Senate. A lot of us might assume that a female Democrat will be a fierce advocate for reproductive rights, but that’s not always a safe assumption. It certainly isn’t the case with Catherine Miranda, who not only won’t advocate to make abortion access a reality in Arizona, but will actively fight against it. She has been doing just that since 2011, when she first started representing her district in the House of Representatives. Next year, as a state senator, Catherine Miranda’s votes will carry even more weight. 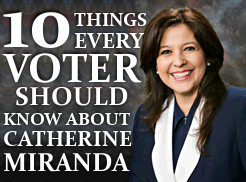 So, without further ado, here are 10 things that every voter should know about Catherine Miranda. 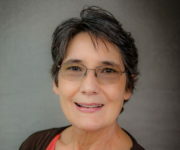 1 Catherine Miranda, who has been running as a Democrat throughout her career, has endorsed Republican Michele Reagan for secretary of state, shunning Democrat Terry Goddard and his proven record as an advocate for reproductive justice and LGBTQ rights. In the 1980s, as the mayor of Phoenix, Terry Goddard helped keep Planned Parenthood patients safe from disruptive protesters, whereas just this year Michele Reagan voted in favor of HB 2284, which was designed to harass patients at clinics that provide abortions. 2 In an even more baffling move, Catherine Miranda has endorsed Doug Ducey for governor. Ducey is an odd choice, given that he is opposed to marriage equality and is expected to sign a bill similar to SB 1062 into law if it comes across his desk. He opposes abortion unless the mother’s life is at stake, and is advised by the far-right Center for Arizona Policy. Why does Catherine Miranda support Doug Ducey’s candidacy?